Joe Sagula knew he could not let his players know what everyone else knew. 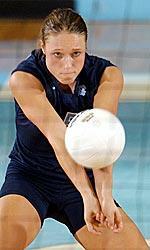 The UNC volleyball team was unranked and had five wins and three losses. Its opponent, Nebraska, was ranked No. 4 in the country and won the national title the season before. On paper his team exemplified the word “underdog,” but as UNC’s head coach, Sagula told them just the opposite before the match at Carmichael Auditorium on Sept. 13, 1996. “We’re going to dominate Nebraska,” he said before delivering a game plan in the locker room. The players might not have dominated, but they did win. Not only did the win raise expectations on the team, but it was a sign of things to come. The “success” came two years later in 1998. The Tar Heels won their first NCAA Tournament match since it became a varsity sport in 1971, and started their current string of five consecutive tournament appearances. Last year, UNC won two matches in the tournament for the first time ever and ranked No.12 in the final national coaches’ poll – the highest it ever had by the end of a season. The players and Sagula, who improved the program in a short period of time, said they were happy with the accomplishments, but not completely satisfied. Before he was named UNC head coach in 1990, Sagula compiled a winning record during his nine seasons at the University of Pennsylvania. He knew the Tar Heels had “an outstanding reputation nationally” for athletics and academics. He also knew an attractive campus and climate would help recruiting. For the young coach, it was an offer he couldn’t refuse. Competing for a national championship may be unrealistic this season, especially after losing four starters to graduation, including ACC Player of the Year Laura Greene. Yet, the expectations have never been higher. While that talent has propelled UNC to a 7-2 record against several renown teams, a lack of playing experience at a high level is a concern. Green and junior Molly Pyles, the middle and outside hitters, along with defensive specialist Caroline deRoeck provide the foundation of game experience and leadership for a team ranked No. 20 nationally in the preseason coaches’ poll. Although experience is lacking, a positive attitude and team unity is not. Sophomore McKenzie Byrd, who has played many games this year as a setter, said she considers all of her teammates her best and closest friends at the University. Sagula agreed. He said the players have never complained, which he said is rare for athletes today. This attitude alone reflects just how far the program has come since he took the helm in 1990. Despite UNC’s success in the 1980s, which included five ACC titles, Sagula had his work cut out for him. The ACC was not a strong conference for one thing. So while the Tar Heels were a regional power, they never won an NCAA Tournament match. Sagula also had unfortunate timing. He took over a team that had graduated a majority of its starters, and hadn’t recruited anyone. With a personality that inspired his players, like the 1996 game against Nebraska, Sagula maintained competitive teams during his early years at UNC. By the year of the Nebraska win, the competitiveness in the conference had been raised with the addition of Wake Forest and Florida State – two teams that joined the ACC after Sagula arrived. Team success also helped UNC recruit better players from around the country. Now, with five players from Illinois on this year’s roster and three from California, the program is established and respected as a national power. As a freshman Pyles hated looking exactly like her teammates. She hated the fact Sagula made sure everyone had their knee pads up and shirts tucked in. Those things that bothered her, she is now thankful for. Pushing players out of their comfort level, demanding more, and building team unity are three important components for a winning team that Sagula stresses on a daily basis. To achieve those components, UNC plays games every practice. Sagula tries to raise the competitive level by keeping score of the games. Fundamental skills, like blocking and digging on defense, are emphasized in practice. Interacting and seeing players’ development is something Sagula likes most about his job. So he doesn’t just work on players’ weaknesses, he harps on them. And if it takes several months, he said, to learn a certain skill it’s that much more rewarding. Even though Georgia Tech and Duke were ranked ahead of UNC in the preseason coaches’ poll, the players and staff still believe they have the chance to win the ACC title. And going as far or further than last year’s team is also a goal. This story first appeared in the Blue & White Magazine in October 2003. As a senior at North Carolina, I interviewed my landlord’s father, John Brooks, a 97-year-old who lived in the same housing complex as me. I wrote this story in the fall of 2003. When I returned from spring break in March 2004, I received a call from my landlord. John had died in his sleep at age 98. At the church ceremony the priest was filling in and did not know John so he read my story and handed it out to John’s family and friends. Before John died, he had given my landlord an envelope and said, open it when I die. Inside the envelope was $200 with a message to have drinks on him. After the church ceremony, John’s family and friends went out for drinks. Brooks appears to value visitors as much as his photos. But he doesn’t get many these days. He admits he’s lazy when it comes to writing letters to friends. “I don’t think he’s ever lied a single time in his life,” said Brooks’s son John, who runs the Town House Apartments with his wife Julia. “And he’s always had a positive attitude. He wakes up whistling and singing. And that’s one of the reasons he’s lived so long.” He’s lived so long his wife, his ten brothers and sisters and many of his close friends have died. I’ve lived in Town House Apartments for more than a year, often waving to him as I whizzed by on my bike. He always waved back and smiled as if we were close friends. Why didn’t I ever stop and say hi? The next time I visited, I didn’t even knock. Even with his hearing aides on, he might not have heard me. I walked in since he never locks his doors during the day. As soon as I sat next to him on the back porch he grinned, and told me he was glad I came right in. In less than a minute, he’s back to the beginning of his story. And if you have a set of ears, he’ll tell you. “He can’t remember yesterday, but he can remember what happened 50 years ago – and names, and dates and days and he’s right on it,” Julia said. And of course, he’ll tell you about his family. That’s why he has those photos specially arranged. They stand on his living room bureau. They’re above it on the wall. They’re on the other wall in the living room. They’re in his bedroom and guest bedroom. When his son, John Jr., was 6 years old, John refused to go on strike despite the fact many workers at Mount Hope were upset. John didn’t believe in striking. He had a family to feed. One night, about 40 strikers appeared in John’s front yard. They told him to join them. With his family next to him, he refused to join. They walked away upset. One worker threatened, “Well, your son has to go to school tomorrow.” John answered, “Yes, he’ll get to school tomorrow. And if he doesn’t get to school tomorrow, you’ll be the first one I see.” Young John got to school with no hassle the next day.